BALTIMORE (CNS) — U.S. Catholic bishops acknowledged that Catholic families and married couples need more support from the church at large and hope to offer it by giving parishes plenty of resources through a pastoral plan for marriage and family life. The pastoral plan was described by Bishop Richard J. Malone of Buffalo, New York, a member of the bishops’ Committee on Laity, Marriage, Family Life and Youth, as a response to Pope Francis’ 2016 apostolic exhortation “Amoris Laetitia” (“The Joy of Love”). 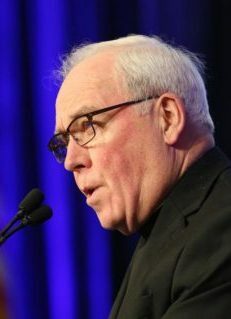 Bishop Malone, who introduced the idea to the bishops, was filling in for Philadelphia Archbishop Charles J. Chaput, the committee’s chairman, who was in Rome for preparatory meeting for the Synod of Bishops in 2018. The bishop said he hoped the pastoral plan would encourage long-term implementation of the pope’s exhortation and also encourage a broader reading of it. Several bishops who spoke from the floor echoed this sentiment, emphasizing that the document was more than just one chapter — referring to Chapter 8’s focus on the possibility of divorced and remarried Catholics receiving communion which gained a lot of media attention. A new pastoral plan for marriage and families would not be “the pastoral plan,” as in the be all end all addressing every detail, but it should provide a framework to help parishes work in this area, Bishop Malone said. After Bishop Malone had stressed before the body of bishops that the program would focus on the entirety of “Amoris Laetitia,” not one part that generated so much attention, a reporter turned back to that section of the exhortation asking the bishop in a news conference if couples living in adultery could receive Communion. “I’m not going to answer that here,” the bishop said, re-emphasizing that the aim of the pastoral plan was to provide married couples with resources they would need to strengthen their marriage and families. Please, Church, consider also the needs of single people in your pastoral planning. Single parents, yes, but also those single individuals who will be forever spouseless and childless. Please don’t cause us more alienation by omitting us from pastoral planning.